Nick Schultz | The Phoenix Jonah Blatt helps lead the Loyola student section in cheers against Southern Illinois. 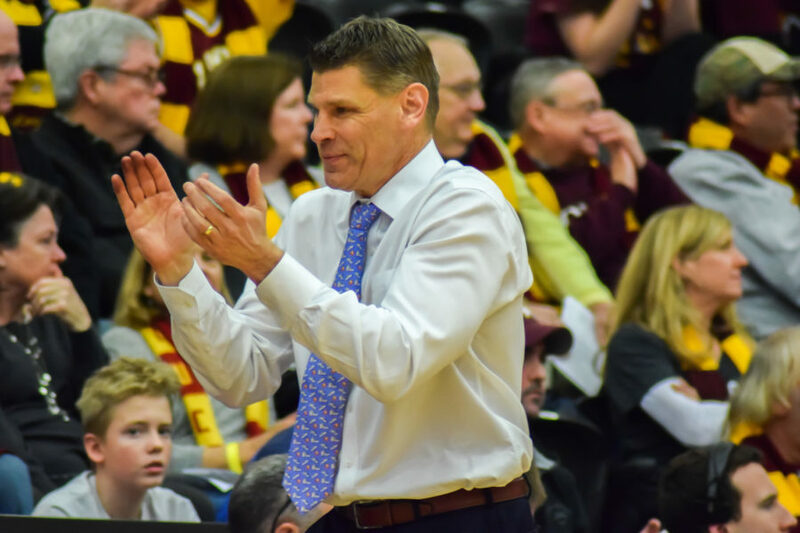 After the Loyola men’s basketball team defeated University of Northern Iowa Jan. 30, head coach Porter Moser took the microphone to personally thank the students for braving the cold weather to go to the game. 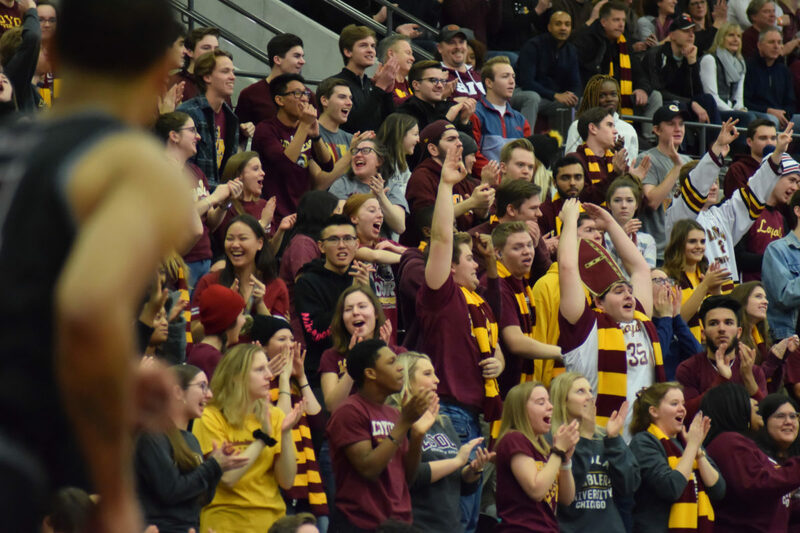 Though Loyola was closed and the wind chill was near -50°F, students came out in droves, and Moser credited them for the win. Tim Edmonds | The Phoenix The Loyola student section “raises the ‘Bler” during a free throw. Through five Missouri Valley Conference (MVC) games this season, Loyola has averaged 3,750 fans. This is a significant increase from the 2,265 fans averaged through the first five conference games last season. At Gentile Arena, the Ramblers are 11-3 overall, including a perfect 6-0 in MVC play. A large portion of that packed house is student fans. At nearly every home game, Gentile’s student section is at capacity. Student tickets are free. Vraj Patel, a sophomore biochemistry major, said he didn’t go to any games last season, but has attended four games so far this year. Loyola’s first season in the MVC was 2013-14 and the average student attendance was 255. Five seasons later, Loyola is the reigning MVC champion and currently in first place in the conference standings while averaging nearly 600 students per game. 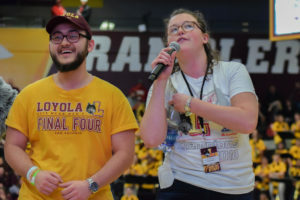 Brian Day, director of marketing and ticket operations at Loyola, talked about how a combination of winning teams and fan promotions has led to a substantial increase in fans throughout his six years at Loyola. “The numbers kind of speak for themselves,” Day said. Loyola’s fan interest has come a long way in the past few years. 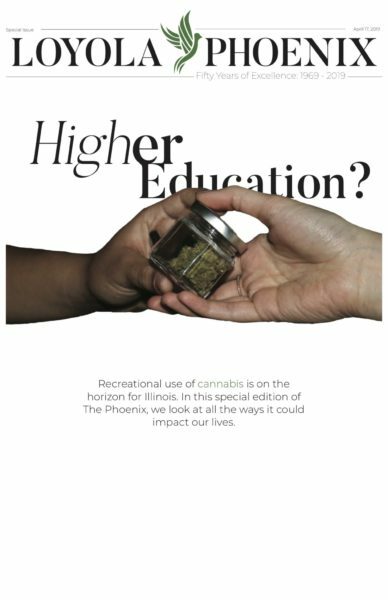 In recent years, Moser has handed out free hot dogs in the Damen Student Center before games as well as writing a column in The Phoenix trying to entice students to attend games. The athletics department has held several promotions throughout the season. From giving away free scarves at the opener against University of Missouri-Kansas City to giving away beanies for the game against Northern Iowa, the athletics department has continued to try to capitalize on the team’s success. However, different from years past, fans aren’t going just for the free items. Patel said he received the free beanies given away at the game against Northern Iowa, but he said the promotions aren’t the main reason he attends games. Through the first 12 home games of this season, student attendance is up 25 percent compared to last season. Earlier in the season, this increase in student attendance caused a problem when the designated student section filled up and students were denied access. Day was among the group of people who came up with the solution to give students tickets to the unsold seats in the arena, regardless of the section. The policy was started before the game against Furman University Nov. 9. 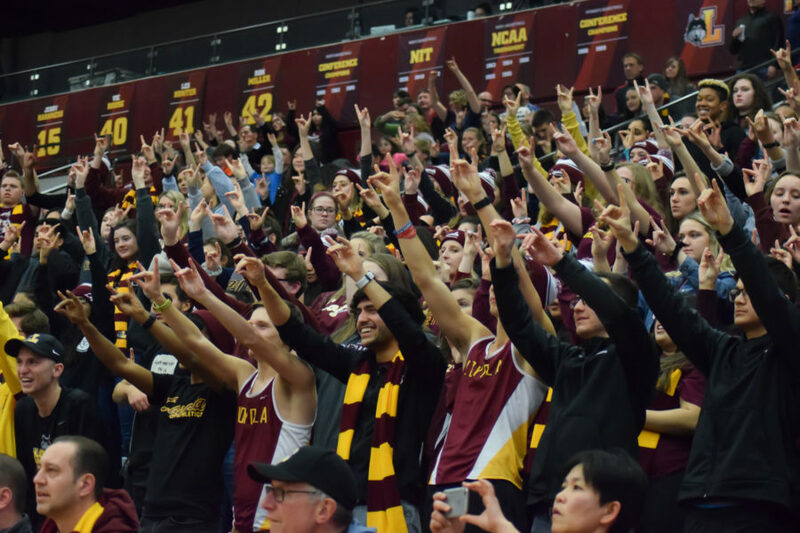 That game featured Loyola’s first packed house of the season, and the athletics department said the new ticket policy was partially responsible for it. The new ticket policy only goes into effect if there are tickets that haven’t been purchased yet. Loyola plays Missouri State University Feb. 17, but the game is sold out so there will be no overflow tickets available once the designated student sections fills up. Students have been lining up early for games all season, and that trend continued when a line formed nearly three hours before tip-off before the game against Northern Iowa. Day said one of the benefits of allowing students to receive unsold tickets is students aren’t forced to stand in line for hours before the game. But they still might have to. Of the three home games left this season, the Missouri State game is sold-out and another against Bradley University March 2 is close to selling out. Loyola’s next scheduled home game is Feb. 17 against Missouri State University. Tip-off is scheduled for 3 p.m. and the game will be broadcasted on ESPNU.